Click on image to enlarge. View more photos. The new president of The United Methodist Church's Council of Bishops gave a nod to the challenges and difficulties of the 2012 General Conference during the closing worship service late May 4 at the Tampa Convention Center. "Many of us, sisters and brothers, leave hurt," said Bishop Rosemarie Wenner of Germany. "We are called to go and make disciples, (even) in these mixed emotions we are in." Preaching her homily on the closing verses of Mark's Gospel following a 10:30 p.m. adjournment, Wenner said that Christ's call to go out into the world applies to each and every one of us, no matter our situation. "We are sent forth to be the church of Jesus Christ at the various places around the globe. We are sent out to proclaim the good news in our local congregations; but even more challenging, out there in the cities and villages to where we are going tomorrow; out there in God's world, the world full of beauty and wonders and full of suffering, brokenness and devastation. Jesus sends us to go. "Christ is there in the young Native American, longing to find his identity. Christ is there in the child fighting against malaria in the village in the Democratic Republic of Congo. Christ is there in my gay brother in the pew. Christ is there in the black American right here in this neighborhood in Florida, angry at a society in which racism is still a daily reality," she continued. "Christ is ready to work with us as we are ready to go. What a message! I had to read it several times, right there in the very last sentences in the Gospel of Mark. It reads: 'While the Lord worked with them.' What a cooperation! Christ working with his disciples. This means the impossible becomes possible. Anxious United Methodists gain hope. 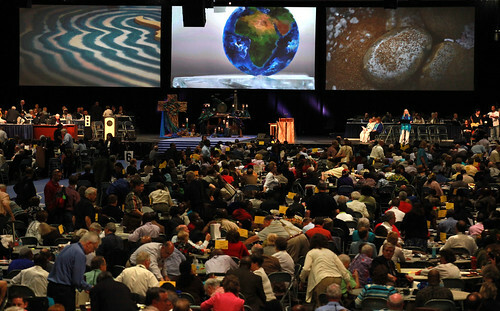 Disappointed General Conference delegates move on together." Christ is ready to work with us, the bishop said, no matter our attitude. "At the end of all our business - unfinished though (it is), as we are ready to go, let us pause for a moment. Let us listen as the risen Christ says to us, 'Fear not! I am with you. And, therefore, follow me.'" Following the recessional, delegates marched out singing the spiritual "Amen." We must be disciples to invite others to be disciples."